The GTA 1 Era refers to three Grand Theft Auto games: Grand Theft Auto 1, Grand Theft Auto: London 1969 and Grand Theft Auto: London 1961. These games are grouped together into an era mainly because they use the same game engine (top-down perspective), have the same aesthetics, follow the same game structure and have interlinking characters, locations (London for example) and storylines. This is also known as the first generation of GTA games from 1997 to 1999. Grand Theft Auto 1 is set in Liberty City, San Andreas and Vice City in 1997. 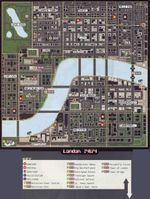 These renditions of the cities are vastly different from their more well-known counterparts in the GTA III Era. In the game, the player can choose from one of about six protagonists, and even change their names. It begins with only one level to choose from. Grand Theft Auto: London 1969 is the first expansion pack, to the original Grand Theft Auto. As the name implies, the game takes place in London in the year 1969. The player once again enters the role of a criminal looking to work his or her way up the career ladder of organized crime. The temporal setting has been exploited through a number of cultural and historical references, including the appearance of a James Bond-like character and the usage of more or less authentic slang. In addition, the cars drive on the left side of the road, as is the case in Britain. Grand Theft Auto: London 1961 is a freely distributed mission pack, also known as an expansion pack, to the original Grand Theft Auto and Grand Theft Auto: London 1969 - requiring both to play. Just as the first mission pack did, London 1961 uses same game engine as the original Grand Theft Auto. The game takes place in London in the year eight years before the events of London 1969. The mission pack as implied includes new missions, 22 new vehicles, one new cutscene, and a new multiplayer deathmatch map based upon the UK city of Manchester. This page was last modified on 24 May 2012, at 20:30.